Dhan Singh Dhami could have been at his duty station as a security guard in Afghanistan by now, but a four-month ban on Nepalis working in the war-torn country delayed his plan. After the death of 13 Nepalis guarding the Canadian Embassy in a terrorist attack in Kabul in June, the government prohibited Nepalis from going to Afghanistan. Dhami was stuck in Kathmandu, and rues: “If it were not for the ban, I would have earned Rs 600,000 by now. I lost three months’ salary,” he said. But one month after the ban was lifted, the 50-year-old ex-soldier is still waiting because he is being given the runaround by his recruiter. He is not sure if and when he will leave Nepal. Dhami first went to Afghanistan in 2004, two years after retiring from the Nepal Army as a second-class warrant officer. He spent his gratuity to find a job in Afghanistan. For the next 11 years, he guarded the American Embassy in Kabul and assisted the US-led military forces in Helmand on behalf of a security contractor. Dhami saw plenty of violence and bloodshed – watching some of his colleagues die in front of him. But he wasn’t afraid, and the pay was good. When he retired from the Nepal Army, he just had an ancestral house in remote Darchula district in the far-western mountains. 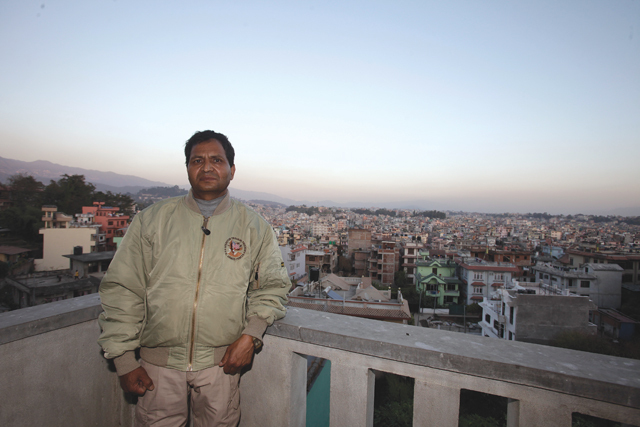 He now owns a two-storey building in a housing colony in Kathmandu. Dhami was previously recruited by DynCrop International, a private American military contractor. He returned home in December last year, and again applied for a job through another company, the British-owned Aegis Defence Services. But the ban came in the way, making his departure uncertain. Buddhi Gurung of the EMP Nepal, a local agent of the British company Aegis, says at least 70 Nepalis were in the final stage of going to Afghanistan when the ban was announced. Since 2011, Aegis has hired 865 Nepalis retired from the British, Indian, Nepal armies and Singapore police. It is still seeking 200 extra guards through EMP Nepal. 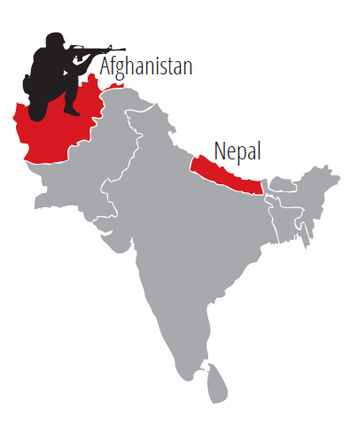 Aegis, DynCrop and all other private contractors filled in for the gap left by Nepalis during the ban by recruiting guards from India and Kenya. In July, the government sent a fact-finding team to Afghanistan to decide whether the country was too risky for its citizens and to recommend safety measures. The Labour Ministry lifted the ban last month on the basis of the team’s recommendation. But it is still not easy for Nepalis to go to Afghanistan because of a new government requirement that private contractors have to submit a copy of their agreement papers with original employers before recruiting guards from Nepal. For example, if the DynCrop needs to recruit ex-Gurkha soldiers to guard the American Embassy in Kabul, it has to send a copy of its agreement with the United States government to Nepal’s Department of Foreign Employment. After the Kabul attack, Sabre International that had hired Nepali guards to protect the Canadian Embassy, was accused of not providing adequate compensation and not bearing medical expenses of the wounded Nepalis. Members of Nepal’s Parliament slammed the Canadian government for trying to wriggle out of its responsibility to help the victims’ families. Although well-intentioned, the requirement has meant that Nepali guards find it difficult to go to Afghanistan even if the ban has been lifted. Private contractors are unwilling to disclose their agreement with foreign embassies in Kabul. Because of this restriction, the contractors that recruit Nepali guards for UN agencies, American and British embassies, and provide better salaries, insurances and facilities have not taken anyone from Nepal even after the lifting of the ban. Only 165 Nepalis have got labour permits to work in Afghanistan as guards, plumbers, electricians and cooks after the ban ended. Iraq was banned in 2004 after the massacre of 12 Nepalis by a terrorist group, but Nepali workers are still going to Baghdad. After Syria and Libya were banned, Nepalis have virtually stopped going there not because of the violence, but because there are no jobs. Another uncertainty is America’s role in Afghanistan under President Trump, who initially called for the withdrawal of the US forces from the region. But lately, he has approved Obama’s plan to retain 9,800 troops there. So Afghanistan will attract more Nepalis in future. Experts say the best way to protect Nepali migrants from being extorted and exploited on en route or in Afghanistan is to facilitate their work by simplifying the recruitment process and easing restrictions.